Indium is a chemical element. It has the chemical symbol In. It has the atomic number 49. It is a rare metal. 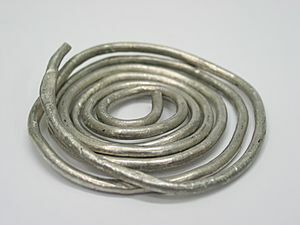 It is a soft, malleable and poor metal. Indium looks like zinc. Pieces of indium can easily be joined together by pushing one piece into another. The chemistry of indium is quite like aluminium or gallium. Zinc ores are the main source of indium. The main use of indium is in the chemical compound Indium tin oxide in liquid crystal displays. It is also used in very thin layers as a lubricant. In World War II it was used a lot to coat bearings in aircraft. InCl3 (structure pictured) is a common compound of indium. A magnified image of an LCD screen showing RGB pixels. Individual transistors are seen as white dots in the bottom part. Indium Facts for Kids. Kiddle Encyclopedia.